. In 1921 Shah Reza Khan establishes a constitutional monarchy. During World War ll he is pro-German.
. In 1941, Britain and the U.S.S.R. invade Iran and use the Iranian railroad for their war efforts. They force Shah Reza Khan to abdicate in favor of his son, Shah Mohammad Reza Pahlavi.
. As of 1941, Shah Mohammad modernizes Iran with American and British support, but also introduces a secret police and totalitarian form of government. He denounces all opposition and sends the religious leader, Ayatollah Khomeini, into exile.
. In 1978 the Iranian Revolution (also known as the Islamic Revolution) begins with demonstrations against the Shah. (This is when the film Persepolis begins.) Marjane’s intellectual, left-wing family denounces the Shah’s abuses. They are delighted when the Shah is forced to flee the country and Ayatollah Khomeini returns from exile to become the Supreme leader.
. Marxists and Communists join together to overthrow the Shah and initially the Islamists allow them free reign to voice their opinions. But soon after the Islamists come into power, they solidify their control, introduce a theocracy, and arrest and execute the irreligious Leftists.
. In 1980 Saddam Hussein of Iraq invades Iran through the Kurdish area and kills 500,000 to 1 million Iranians with chemical warfare. He takes over the oil reserves and the Iranian-Iraqi war continues until 1988.
a. Persepolis is autobiographical. The author, Marjane Satrapi, begins her story when she is 9 years old in 1978 Tehran and dreams of being the last prophet of the Galaxy. We see all stages of her life until she is 25 years old, married, divorced and on her way to live in Paris, France.
. Students can discuss what motive an author has when he/she writes an autobiography.
. to immortalize one’s ego. b. The title, Persepolis, means something. Discuss what and where was Persepolis? Discuss why the author uses this as the title for her film and graphic novels.
. Persepolis was the name of the Persian (Iranian) capital that dates from 500 B.C. It is situated 70 kilometers north east of the present city, Shiraz. Darius the Great built the palace, terraces, military quarters, treasury, reception quarters, and main buildings.
. Persepolis was built as a celebration of the Persian Empire’s greatness and as a gathering site to celebrate special events.
. Today it is an archaelogical site that has intact sculptures and bas-reliefs that tell the history of the Persians. a. Persepolis is an animated film in black and white made by cartoonist, Marjane Satrapi, with fellow cartoonist, Vincent Paronnaud, based on four of Marjane’s autobiographical graphic novels: “Persepolis 1,” (2000) which recounts the story of her childhood. “Persepolis 2,” which is the story of her return to Iran from Vienna. “Persepolis 3 and 4” are the stories of her life in Iran during and after college. b. The structure of using graphic novels and putting their images into animated format in black and white with simple characters, is a breakthrough in cinematic technique. The cartoons are viewed as abstractions but contain in their simplicity a great deal of emotion and dynamism. To adapt the graphic novel content into cinema animation, the art director and executive producer, Marc Jousset, created a special design that they did by hand. c. The film, in the format of a light comic book style, interjects deep thought and philosophical interpretations with a myriad of themes: political totalitarianism, religious oppression, teenage rebellion, cultural dissonance, war, exile, and immigration. 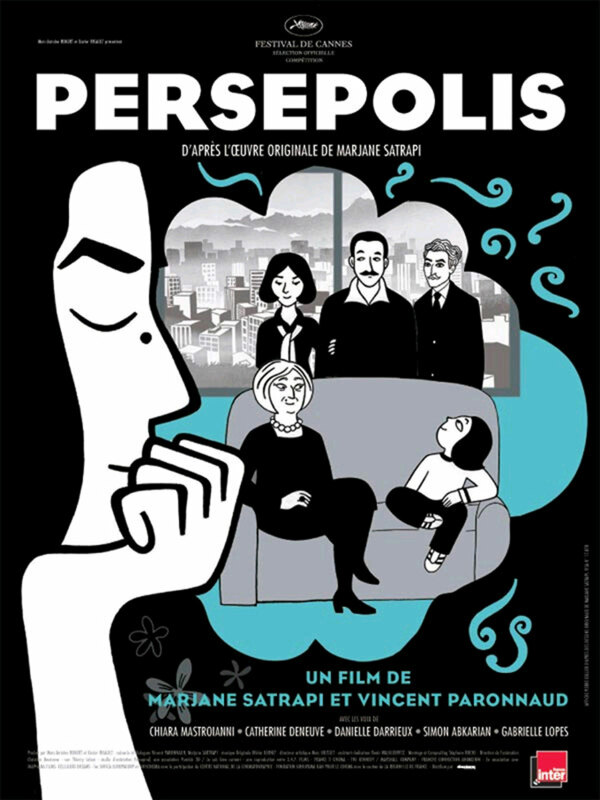 d. Persepolis is based on Marjane Satrapi’s memoirs of her first-hand experiences of living in Iran under the Shah and the Fundamentalists, from the 1970s until 1994. She recounts her teenage years as a student in Vienna, Austria; her return to a theocratic Iran; and her need again to leave the country, this time permanently. 1. Who was Shah Mohammad of Iran? Why did Communists and Marxists denounce the Shah? Why did Islamists, who took power after the Shah, allow the Marxists and Communists to express their opinions and demonstrate? Why were they soon stopped?
. The Communists and Marxists denounced the Shah’s government for being imperialistic and being supported by the West, the U.S. and U.K.
. The Islamists were anti-capitalistic, anti-Imperialistic and anti-American; so initially they allowed the Communists and Marxists freedom to speak. However, once the Islamists were securely in power, the religious government began to restrict the Leftists.
. The Communists and Marxists were anti-religious and the Islamists could not accept such dissension under their theocratic rule. The Leftists were thus marginalized and exiled; those who remained in Iran were executed in 1988-89.
a. Her uncle Anoosh is a Marxist and takes great pride in teaching her to carry on the family’s Leftist tradition. There are several scenes with him. b. Marjane denounces a boy’s father who works for the secret police. Then she tries to befriend the boy but is rebuked. c. Marjane opposes the religious teachers in her school in Tehran. d. The Iran-Iraq War takes place and Marji sees for herself the horrors and destruction from war. e. Her father is threatened by teenage government officials who threaten him with machine guns. f. While in Vienna, she opposes a series of people from different social-political backgrounds. g. She opposes the religious professors in her Iranian university. 1. How do we identify with Marjane even though we come from different cultures? her likes and dislikes, her fears and ambitions, her rebellious spirit, her desire to be free, and her young womanhood.
. Author/director, Satrapi, shows the change of Teheran from a modern urbane culture with a tradition of democracy and independent thought (pre-Shah), to an Iran repressed by Islamic Fundamentalists who have reverted the country into a medieval society.
. Under Iran’s totalitarian government, we see an omnipresent secret police; how intellectuals are suspected and arrested; and how common party supporters are rewarded. We view a scene how the window washer becomes the chief hospital administrator and decides which patients can travel abroad for medical care. Marjane’s uncle is such a victim, for he needs cardiac surgery in the U.K. but he is denied the right to leave and consequently dies.
. Under Shah Mohammad Reza Pahlavi’s rule (1941-1979) there is a constitutional monarchy but he rules with an iron hand supported by a tyrannical secret police that arrests and executes dissidents.
. After the Shah’s rule, Ayatollah Khomeini returns from exile in France to Teheran and installs a theocratic constitutional Islamic rule. He, too, tyrannizes the population with his secret police, tyrannical arrests, and mass executions of dissidents.
. Students can list some of the rigid controls that the new Islamic government under the rule of the Ayatollah imposes on Marjane, her family and their society.